Welcome to Chabad of Hawaii's Tourist Information Page. We are located on the island of Oahu, in beautiful Waikiki and also have Chabad Houses on Maui, Kauai, and the Big Island of Hawaii. For neighbor island Chabad Houses' information, please click here. Below is some general information we've compiled for the standard visitors' questions which are pertinent in Honolulu and the island of Oahu ONLY. Our offices are open from 9:00 am - 5:00 p.m., Monday throughThursday. (If you need to reach us on a Friday, try emailing before calling, as we have a skeleton office staff on Fridays. [You can try until noon Hawaii time on Fridays].) Please feel free to call with your inquiries and reservations. Please do read further so you will be better equipped with information before calling. For Mikvas Batsheva information and appointments, please click here. Our Chabad House is located at 410 Atkinson Drive, adjacent to the Ala Moana Hotel. Many visitors choose to stay at the Ala Moana over Shabbat as it is the closest hotel to Chabad. If you would like to stay at the Ala Moana, it is helpful both to Chabad and visitors if you make the reservations through the Ala Moana Hotel or the hotel in which you are staying. You can also stay at the Modern or the Hawaii Prince which are both within walking distance of the Chabad House. If you will be eating Shabbos meals at Chabad House (see below), you are welcome to light candles here with us (as it is halachically permissible to light either where you eat - or where you sleep.) And since most hotels do not allow candles burning in the room, it may be easier for you to light at Chabad House. We have beautiful communal Shabbat meals every week at Chabad House, in a warm, delightful atmosphere! SAVE ON A PACKAGE DEAL FOR BOTH SHABBAT MEALS! **Cancellation Policy for Shabbat Reservations: Less than one week after reservations were made - 80% refund. One week or more from the date reservations were made - 60% refund. Within 72 hours of Shabbat - No refund. If you have no internet access, you can call our office at 808-735-8161 and we will be happy to take your reservation. As of now, there are no kosher restaurants here. There is one kosher caterer who does take out/deliveries - Oahu Kosher http://www.oahukosher.com/, 808.888.4949. You can order food for during the week from him during your stay in Honolulu. Oahu Kosher will also prepare and ship your meals to neighbor islands. There is no kosher supermarket in Honolulu. However, you can find regular products with a hechsher at most supermarkets, Whole Foods (Kahala Mall) and (to a lesser degree) Safeway (either the Kapahulu branch or the one on Piikoi & Beretania Streets) have more than most other places. Please do not hesitate to email us at info@chabadofhawaii.com or call us at 808-735-8161 if you have any more questions. HAWAIIAN AIRLINES: IF YOU ARE FLYING TO HONOLULU WITH HAWAIIAN AIRLINES, YOU MAY BE ABLE TO HELP US AT NO COST TO YOU! PLEASE CONSIDER ENROLLING AS A HAWAIIAN MILES FREQUENT FLYER & DONATING YOUR MILES TO CHABAD OF HAWAII! All it takes is 5 minutes of effort on your part and you can help us considerably - a wonderful mitzvah that is easy for you to do! To discuss this, please contact Mrs. Perl Krasnjansky at 808-478-8892 or pearlkras@gmail.com. Many thanks. With many thanks to the Goldberger Family of Brooklyn, New York, and many other donors who made it possible, Chabad of Hawaii now has a functioning women's mikvah, Mikvas Batsheva. APPOINTMENTS MUST BE MADE IN ADVANCE. To book an appointment and for directions, only: please call Mrs. Perl Krasnjansky at 808-478-8892 or email pearlkras@gmail.com. The Mikvah fee is $50 per usage, which helps us to keep our mikvah doors open. If you would like to make an additional donation to help our mikvah stay open, we would be very appreciative. For more information please click here. 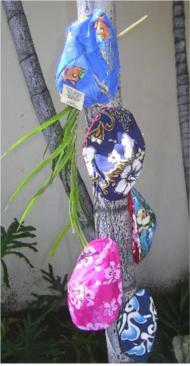 Additionally, you may want to consider purchasing our unique and beautiful Aloha Hawaiian Kippot! They are sewn especially for us, made of cotton, with prints wearable on both sides and wash beautifully - and make a unique gift or souvenir of your stay in Hawaii. Each kippah has a different combination of patterns. Please call us if you are interested in purchasing any of these lovely yarmulkes. The kippahs are $8 each (+ shipping & handling, if we will be mailing them to you). Chabad of Hawaii is supported solely by donations from our friends and visitors. If you would like to make a donation to help in the holy work of bringing all Jews closer to Torah, we would greatly appreciate it: "Gedola tzedaka shemekarevet et hageulah" - "Great is the power of tzedakah, for it brings closer the final redemption". We look forward to seeing you at in our Chabad House and at our Shabbos table, and hope you will enjoy being here with us as much as we enjoy hosting you!